NATS Chat – presented by Inside View Press, allows participants to network and discuss various topics in an online forum. Sessions are usually held the second Sunday of each month of the academic year: 9–10 pm Eastern Time, 8–9 pm Central, 7–8 pm Mountain, and 6–7 pm Pacific. To register and have an e-mail reminder sent to your inbox on the day of the chat, simply click the link below each session. NATS Chat takes a summer hiatus June-August. For those who attended the NATS National Conference last June in Las Vegas, you know what engaging artists and people these two women are. Please join us wonderful for a stimulating conversation concerning aspects of a singing career, technique and wherever else the discussion leads. NATS President Karen Brunssen examines how the human vocal instrument transforms from infancy through old age. At every age, vocal function is dependent upon how the body is progressively and constantly changing. Her recent book release "The Evolving Singing Voice: Changes Across the Lifespan" discusses these changes and their direct impact on the singing voice. Also joining the discussion is contributing author Chadley Ballantyne from the University of Northern Colorado School of Music. Guests/Topic: Cynthia Vaughn, Kelli Barham, and Christin Coffee Rondeau: Independent Studio Business: Part III ~ “Finding Them and Keeping Them: Studio Marketing and Student Retention"
This lively session with independent studio owners Cynthia Vaughn, Kelli Barham, and Christin Coffee Rondeau centered on strategies to attract the types of students you wish to teach and ways to integrate retention within your business model. Vaughn is the owner/director of Magnolia Music Studio in Richland, WA. Barham has a home-studio in Moscow, ID, and is a recipient of the Joan Boytim Frey Award for Independent Teachers. Rondeau is co-founder and teacher at Sand Dollar Music in Dayton, OH. Guests/Topic: Mary Saunders Barton and Norman Spivey: "Bel Canto Can Belto–Cross Training for the 21st Century Singer"
This month's session features Mary Saunders Barton and Norman Spivey. 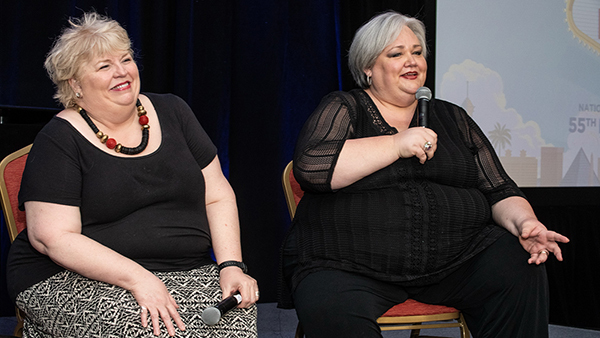 The session focused on principles from their new book, “Cross-training in the Voice Studio: A Balancing Act.” Saunders Barton and Spivey emphasize that the next generation of voice teachers will have their studios filled with singers of many different stripes. It will be their responsibility to recognize and foster healthy dynamic singing in many styles, celebrating them all, judging none. Guests/Topic: Chadley Ballantyne and Kerrie Obert “Getting the Twang of it: Updates on the Physiologic, Acoustic, and Perceptual Characteristics"
“Getting the Twang of it: Physiologic, Acoustic, and Perceptual Characteristics" featured speech language pathologist Kerrie Obert and assistant professor of music, voice Chadley Ballantyne discuss twang and its applications in singing. Ms. Obert presented MRI and endoscopic discoveries and Mr. Ballantyne discussed the acoustic implications and applications of twang for classical and contemporary singing styles. This month's NATS Chat focuses on motor learning. Lynn Helding and Lynn Maxfield discus motor skill acquisition and how to improve your students learning process by improving the feedback you give in a voice lesson. “When we talk about motor learning we are talking about how muscles process information and how they actually learn,” says Lynn Helding. This lively discussion covered a variety of elements of this process and how to apply them in your studio. NATS Chat this month featured Ian Howell, whose work explores the special psychoacoustics of the singing voice with an eye toward practical applications for singers and voice teachers. Singing is, at its core, and aural art form. Computer measurements tell us something true about the sound wave in the air, but miss qualitative aspects of timbre dependably imparted by the ear. By coming to understand the way the ear behaves, we can ask how one might possibly perceive a singing voice. This is another way of asking what sounds the human voice is capable of making. Guest/Topic: Scott McCoy "The more things change, the more they stay the same: some thoughts on (my) current pedagogic practice"
Featured guest Scott McCoy presented "The more things change, the more they stay the same: some thoughts on (my) current pedagogic practice." Scott McCoy is a past president of NATS and author of “Your Voice: An Inside View.” Thanks to our participants for the many great questions and feedback. "Putting it Together: Bit by bit...Day by Day...Week by Week...Year by Year…"
A Conversation with Joan Lader, honorary Tony Award winner and renowned Broadway voice teacher. Joan Lader has worked as a voice therapist and teacher in private practice in New York City for more than 30 years. Her extensive practice, which includes leading singers and actors from Broadway, film, opera, R&B, rap, and rock, provides training and development of professional singers, and vocal therapy for injured voices. As a follow-up to last Spring’s NATS Chat "Starting and Running Your Independent Voice Studio as a Small Business,” Cynthia Vaughn explores “What’s Next?”—ideas and alternate business models to expand, redefine, or refocus your studio. Cynthia is joined by NATS members Nate Plummer and Michelle Markwart Deveaux. From the fields of both singing teachers and speech language pathology our experienced panel shares a wealth of knowledge when working with this specialized population. Renowned voice teacher Janice Chapman discussed her holistic approach to teaching and why it is important for voice teachers to engage in current research to inform their practice. We also explored her approach to the basic physicality of “primal sounds” and more. Renowned laryngologist Al Merati, MD (University of Washington Otolaryngology Department) and Metropolitan Opera singer Michaela Martens were our guests for a discussion on how to care for the singing voice; stigmas around voice injuries; how not to catastrophize having a voice injury; and other vocal health considerations for singers. The discussion centered around the perspective of both the medical community and the singer, and the importance of understanding this important collaboration. The session was co-moderated by Kari Ragan and Margaret Baroody. Reference at 40:00 - NATS offers www.Vocapedia.info, a dynamic information database that is committed to sharing information about the science of voice with the teaching community around the world. Reference at 44:00, NATS advocates for everyone having a voice pedagogy / health / anatomy course or courses. This standard is under the purview of National Association of Schools of Music as an academic accrediting organization. Reference at 47:00, NATS encourages SLPs to study more content about singing and the singing voice. Topic: “Teaching Very Young Singers"
Shannon Coates shared her extensive experience to discuss the special dynamics of teaching very young singers. The lively and informative chat included expectations for very young singers, tools and resources for independent voice studio teachers, and incorporating the instruction of very young singers into voice pedagogy curricula. Successfully guiding tenors/male singers into the upper extension requires patience, creative approaches, which are thoroughly grounded in voice acoustics and physiology, and positive reinforcement. John Nix joined us for an interesting conversation in guiding voice teachers through this process. The term CCM (Contemporary Commercial Music) is now part of the nomenclature for teachers of singing. However, there is a broad spectrum of sounds within CCM beyond belting. This panel represents a variety of genres and will discuss singing gospel, rock, music theater and more. October NATS Chat - Guest: Don Greene, Ph.D., "Performance Success: An Olympic Sports Psychologist Teaches Performing Artists How to Win"
Performance psychologist Don Greene opened our NATS Chat season with empowering advice for the vocal performer. His story of coaching a pair of Miami Opera apprentices and his own life-changing, first-time-at-the opera experience is one of many inspiring insights from his career. For more information about Don Greene go to www.dongreene.com. Click to watch the October 2016 NATS Chat. Savvy singer Cindy Sadler was featured in Sunday evening’s NATS Chat. A columnist for Classical Singer, Cindy addressed a variety of questions on the business side of managing a singing career and gave practical advice tailored for all career stages. Click to watch the November 2016 NATS Chat. Panelists Michael Johns, M.D., and Peggy Baroody led an informative discussion on the topic of "The Aging Voice" for the December 2016 NATS Chat. The panelists answered a variety of questions about the special considerations for singers as their voices age. They emphasized strategies to accommodate, embrace and adapt to these physical changes, in order to remain an effective communicator and artist. Click to watch the December NATS Chat. January NATS Chat - Guests: Wendy LeBourgne and Marci Rosenberg,"Kinesthetics to Training the Vocal Athlete"
In the world of singing, motor learning and exercise physiology are hot topics. Catch the replay with panelists Wendy LeBourgne and Marci Rosenberg for a lively conversation on "Kinesthetics to Training the Vocal Athlete." Click to watch the January NATS Chat. February NATS Chat - Guest: Dr. Scott McCoy, “How Much Science Do We Really Need to Know?" Dr. Scott McCoy presented the topic, “How Much Science Do We Really Need to Know.” The author of “Your Voice and Inside View” shared direct advice the application of science in the voice lesson. Several of the opening slides did not display properly in this recording, so we have provided a link to Dr. McCoy's complete slide presentation. Click HERE to view the slides. Click to watch the February NATS Chat. March NATS Chat - Guest: Cynthia Vaughn, "Starting and Running Your Independent Voice Studio as a Small Business"
NATS Chat guest Cynthia Vaughn led the topic "Starting and Running Your Independent Voice Studio as a Small Business," while addressing dozens of questions and comments from participants. Cynthia serves as the "Independent Voices" associate editor of the NATS "Inter Nos" newsletter. Click to watch the March NATS Chat. April NATS Chat - Guest: Lisa Popeil, "Transitioning from Classical to CCM Vocal Styles"
Celebrity LA voice coach Lisa Popeil, MFA in Voice, is one of America's top voice experts. Based in Los Angeles, Lisa offers vocal lessons, workshops, the Total Singer DVD and Voiceworks®, featuring innovative tools for safe 'belting' for musical theater and commercial vocal styles. Lisa shared her valuable knowledge and gave practical demonstrations during this lively hour. You'll also want to download her excellent Voiceworks® handout. Click to watch the April NATS Chat. May NATS Chat - Guest: Robert Edwin, "Teaching the Young (and Very Young) Performer"
“Although child voice pedagogy has finally begun to emerge from the dark hole of ‘don't teach children systematic voice technique before the teen years,’ remnants from the bad old days still hang around,” says Robert Edwin. He is amazed at the large number of his fellow pedagogues who still view children as vocally fragile creatures. “Simply put, it just ain't true!” Peggy Baroody also served as a panelist and Kari Ragan hosted the session. Inside View Press: "Your Voice - An Inside View"
Click to watch the May NATS Chat. October NATS Chat - Audition Recordings: Considerations for YAP and Academic Programs.